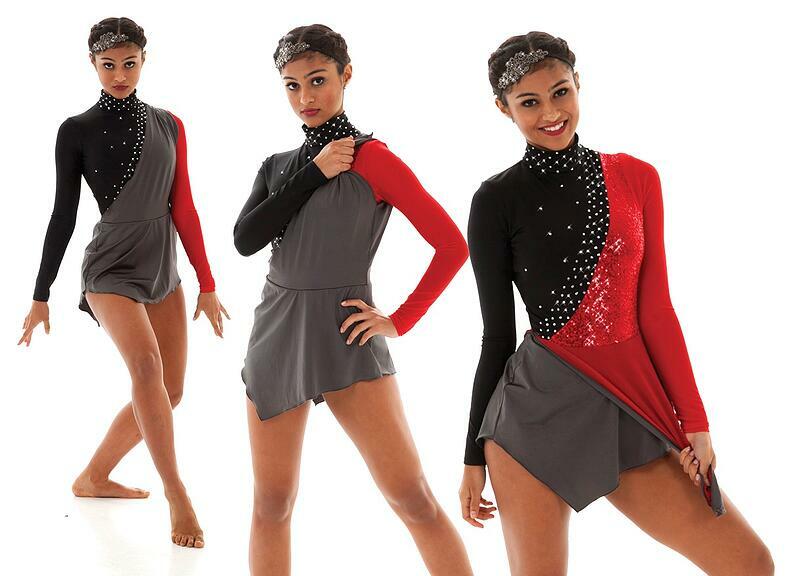 As we head into competition season, we've gotten a lot of requests for the crowd pleasing Transition Costume. Transition Costumes deliver that WOW factor to the crowd (and the judges!) that everyone likes to see. But they're also COMPLICATED! How do you even begin to design one? Find out what the most effective transition costumes are, and some tips for designing them below! What is a Transition Costume? A transition costume contains a change element during your routine, achieving a costume transformation but without having to physically change costumes. Most often, a piece of the costume is held in place with an easy-to-alter closure like snaps, Velcro, or magnets, and can be pulled down or removed to reveal a visual illusion of a new costume. Examples of Effective Transition Costumes. This is when the bodice of the costume drops into a skirt. Usually, a piece is held into place with snaps at the shoulder of the garment. 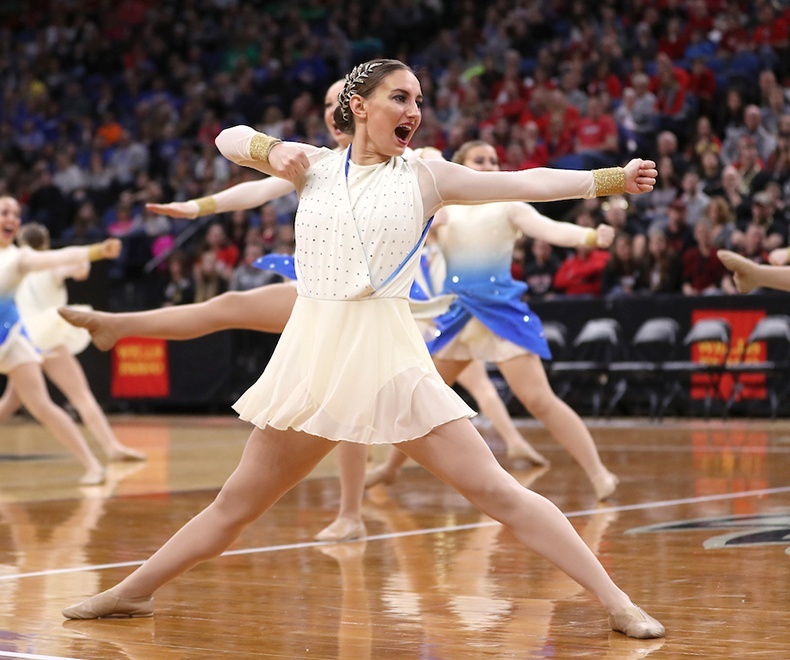 Chaska Hawks Dance Team created a dramatic color change by pulling down the bodice of their costume to reveal a blue ombre skirt! Aitkin All Starz Dance Team pulls a flag out of the sleeve of their costume at the MN State 2016 Competition. This is generally achieved by wrapping fabric around the waist, arm, or leg and pulling it off to be used as a prop during your routine. Aitkin Jazz Team wrapped sash around their waist to recreate a badge to honor fallen officer SteveSandberg. 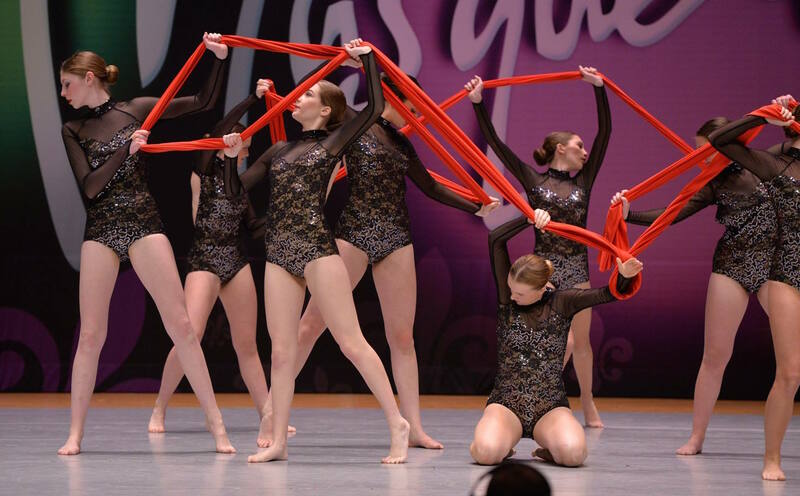 South Metro Dance Academy Diamond's Team used a gorgeous red fabric prop during their performance at Dance On Parade. This is when a piece of the skirt or a flap can be unsnapped to reveal another color. Transition costumes are always crowd pleasing and can set you apart from the competition! But, they can also be confusing and difficult to design. It's important to have extra time and patience during the design and choreography process to get it right. And then practice, practice, practice! 1. Make Sure You Have the Time and the Budget! Transition costumes need a higher budget than the average dance costume. They require more prototypes and more design team problem solving! This is because it can take multiple samples and trial and error to get the transition costume to function properly, look its best, and to coordinate with the choreography to ensure that everything runs smoothly. It's not unusual to create a powerful look for over $250. Our biggest advice is this: keep it simple and don't try to do more than one type of transition per costume. For example, pulling down a sash to reveal a color is an easy transition, but putting the sash back up for a second transition is difficult to achieve. Color change transition costumes are the easiest to pull off, and can create quite the WOW factor! Theme change costumes can be too complex. 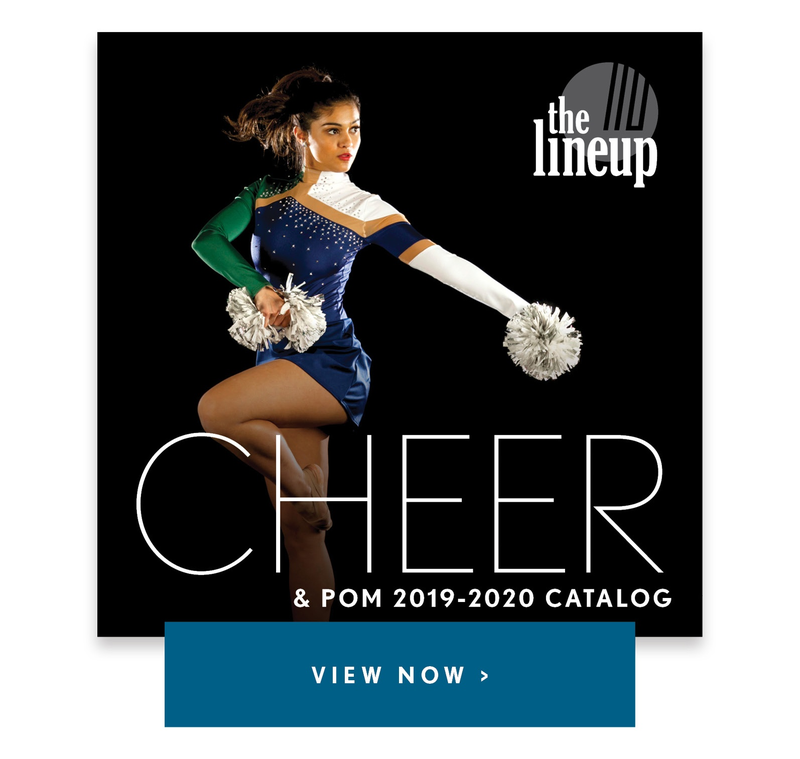 For example, a transition from fire to ice is an easy color change transition, but an entire theme change from fire into a Phoenix is much more complex for planning- for the designer and your team! Another consideration is what type of closure you're using. You want to keep the closure easy to change on the fly. For example, a snap or a magnet is much easier than untying a laced tie! Transition Costumes can and will fail even if they are designed seamlessly, you've practiced relentlessly, and it has been pulled off smoothly before! Sometimes a snap comes undone in the middle of a routine thats always been clean before. It's just the risk! 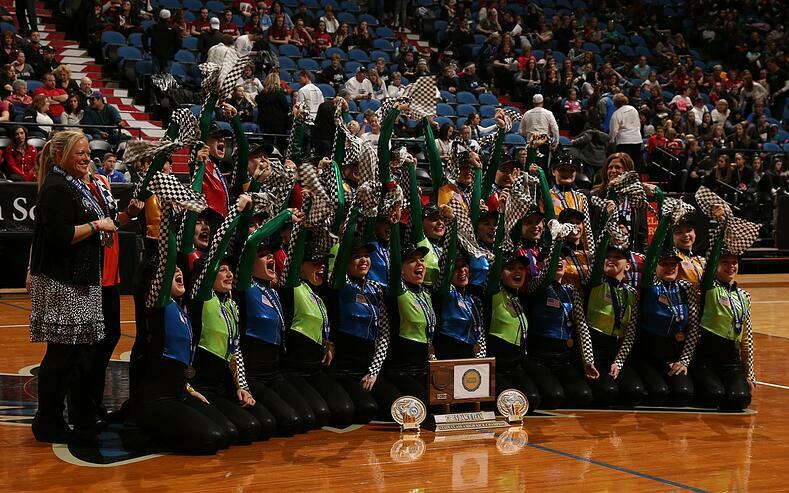 We recommend researching your state's competition rules before you begin designing or choreographing your routine. Certain states do not allow for assisted transition costumes, which means dancers must transition their own costumes, and cannot help each other transition. This has a big effect on the design of the costume on how the costume functions. A solo transition costume closure must be within reach of the dancers hand (i.e. don't put the closure in the middle of the dancers back where they can't reach it). Transition costumes will never look perfect - it's just the result of conforming one pattern piece to two different parts of the body. Don’t expect the garment to be form fitting. Skirts are typically flowy and lose, so when they are held up on the bodice before the transition, they will also look loose on the bodice. You’ll also likely see the closure on the garment. You can do your best to camouflage this with fabric choices and rhinestoning, but in most cases it is impossible to completely hide a closure. You'll have to decide if you're okay with a visible closure, but remember, most aren't noticeable from a distance, where judges are likely viewing your routine. Senior Designer Michelle, Fit Model Sophie, and Creative Director Deb make adjustments to online transition style Avatar . For starters, you may not be able to see how you are going to transition your costume until you can actually practice in the sample costume. From a design and pattering perspective, it’s hard to explain how the end result will be achieved. So, sometimes you just have to trust that the designer will give you the end result you want! "It's confusing!" senior designer Michelle laughed. 7. Practice a LOT in Order to Nail It! Make sure you can DO the transition smoothly and correctly - without halting your routine. The best transitions are pulled off fluently and are seamlessly worked into the choreography. 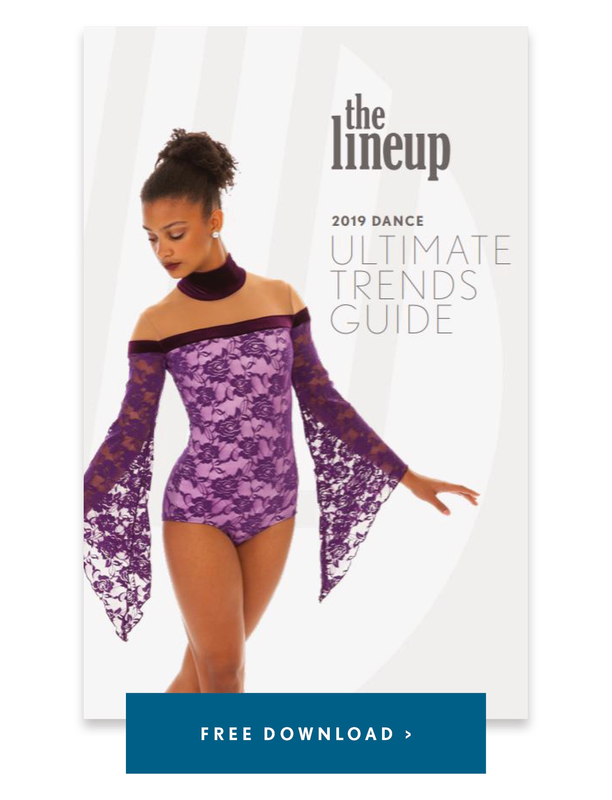 "When designing a transition costume, we not only had to think about the first and second looks, but how we were going to make the transition seamless with the choreography and STAY there [and not transition back] once we make the change," explained Pam, former coach of the St. Thomas Dance Team.